A gunman killed 26 worshippers at a Texas church. Here’s how witnesses and officials say the tragedy unfolded. (Darren Abate | The Associated Press) Law enforcement officers gather in front of the First Baptist Church of Sutherland Springs after a fatal shooting, Sunday, Nov. 5, 2017, in Sutherland Springs, Texas. 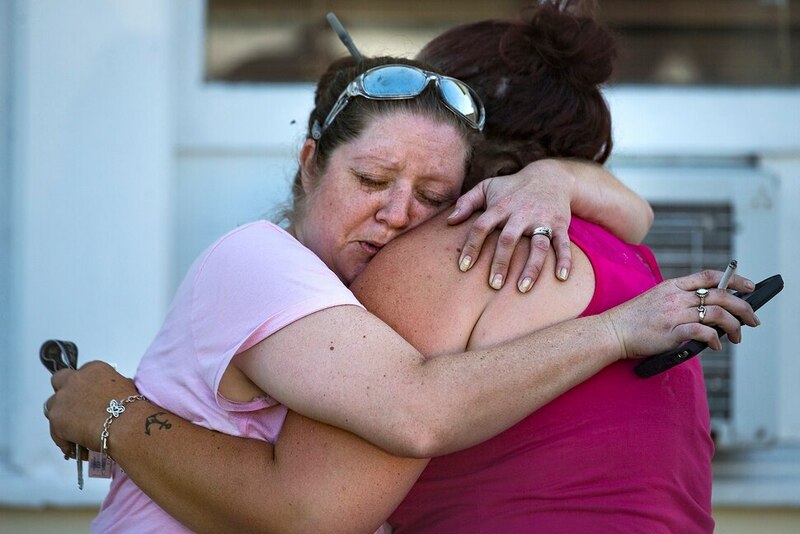 (Nick Wagner | Austin American-Statesman via AP) Carrie Matula embraces a woman after a fatal shooting at the First Baptist Church in Sutherland Springs, Texas, on Sunday, Nov. 5, 2017. Matula said she heard the shooting from the gas station where she works a block away. (Nick Wagner | Austin American-Statesman via AP) Law enforcement officials work the scene of a fatal shooting at the First Baptist Church in Sutherland Springs, Texas, on Sunday, Nov. 5, 2017. (Nick Wagner | Austin American-Statesman via AP) Law enforcement officials work the scene of a fatal shooting at the First Baptist Church in Sutherland Springs, Texas, on Sunday, Nov. 5, 2017. (KSAT via AP) Emergency personnel respond to a fatal shooting at a Baptist church in Sutherland Springs, Texas, Sunday, Nov. 5, 2017. (Jay Janner | Austin American-Statesman via AP) Investigators work at the scene of a mass shooting at the First Baptist Church in Sutherland Springs, Texas, on Sunday Nov. 5, 2017. A man opened fire inside of the church in the small South Texas community on Sunday, killing more than 20 people. (Jay Janner | Austin American-Statesman via AP) Enrique and Gabby Garcia watch investigators at the scene of a mass shooting at the First Baptist Church in Sutherland Springs, Texas, on Sunday Nov. 5, 2017. A man opened fire inside of the church in the small South Texas community on Sunday, killing more than 20 people. (Nick Wagner | Austin American-Statesman via AP) Mona Rodriguez holds her 12-year-old son, J Anthony Hernandez, during a candlelight vigil held for the victims of a fatal shooting at the First Baptist Church of Sutherland Springs, Sunday, Nov. 5, 2017, in Sutherland Springs, Texas. Sutherland Springs, Texas • A lone gunman stormed a small community church here on Sunday and fatally shot more than two dozen people before fleeing several miles from the scene, where he was found dead, authorities said. 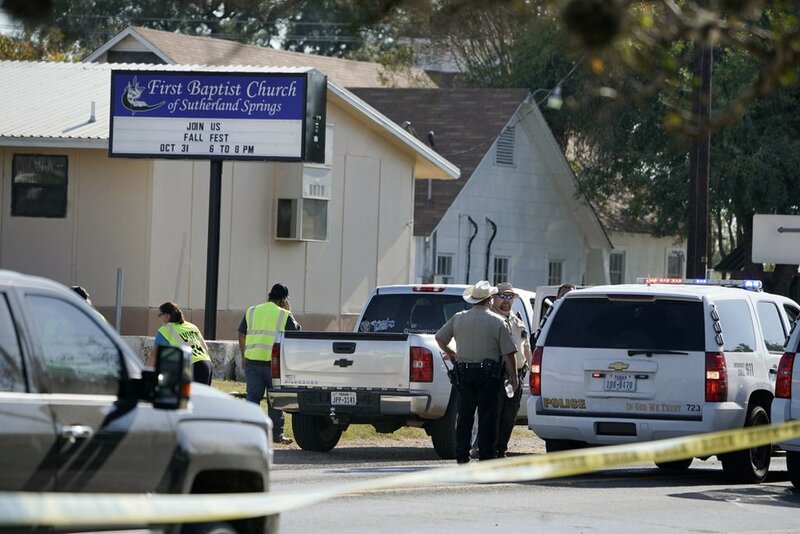 Witnesses said a white man in his 20s dressed in all black and wearing a tactical vest started shooting with an assault rifle as he approached First Baptist Church in Sutherland Springs. Police said the gunman killed two people outside before entering the church and spraying bullets at the congregation during morning services in the countryside town about 30 miles southeast of San Antonio. At least 46 people were hit with bullets, and the dead ranged in age from 5 to 72, authorities said. Most were shot in the pews as they worshipped. Two law enforcement officials told The Washington Post that the suspect has been identified as Devin Kelley, 26, a Texas man who lived in a nearby county. Those officials did not see any immediate sign that he was motivated by international terrorist groups, but they cautioned that the investigation is still in its early stages. Authorities had not provided any information about a possible motive for the shooting as of Sunday evening, and residents of this small, out-of-the-way town said they were rattled and dumbfounded at becoming yet another U.S. community victimized by a mass shooting. Neighbors said they became aware of the shooting when they heard loud bangs - and even had bullets spray into their homes — shortly after 11 a.m. Sunday. Local authorities said the first calls of an active shooter came in about 11:20 a.m., after the gunman opened fire with a Ruger assault-style rifle. Kevin Jordan, 30, was changing the oil in his Ford Focus ahead of a family road trip when he heard the pops of gunfire. When he stood up and turned his head, he saw a man wearing body armor, a vest and a mask walk down the sidewalk toward the church about 50 yards from his home. Authorities said that at least 23 of the slain were killed inside the church. They said that two people were shot and killed outside and that one died at a hospital. As the gunman exited the church, he was confronted by a local resident who, armed with his own weapon, began firing, prompting the suspect to flee in his vehicle. Authorities said they found multiple weapons in the gunman’s vehicle. After spotting the shooter, Jordan said, the father ran inside his home, scooped up his son, alerted his wife and rushed his family into their bathroom, where they crouched and hid while calling 911. He said the shooter spotted him as he fled and took a shot that went though his front window, nearly hitting his 2-year-old son. “I looked at the shooter, and he looked right at me,” he said. When the shooting stopped, Jordan, who works as a medical assistant, ran to the church, hoping to help. Tucked a few hundred yards off Highway 87, amid scrubby farmland, the dusty and usually quiet streets of Sutherland Springs, lined with modest one-story family homes and trailers, were swarming with law enforcement Sunday evening. With few street lights, a town that typically goes dark after sundown had flashing red and blue police lights on almost every block. Federal authorities, including from the Bureau of Alcohol, Tobacco, Firearms and Explosives and the FBI, were on the scene. The Texas Ranger Division of the state’s Department of Public Safety also is involved in the investigation. The shooting Sunday came more than a month after a masked gunman stormed into a small community church outside of Nashville and shot seven people, including the pastor, killing one. Authorities said the suspect in that shooting, Emanuel Kidega Samson, might have been motivated by a quest for revenge for a 2015 shooting that targeted black churchgoers in Charleston, South Carolina — a shooting that left nine people dead. Few details were immediately available about Kelley, and attempts to reach his family were unsuccessful on Sunday. Kelley had at one point been in the military, enlisting in 2010 and serving as a logistical readiness airman stationed at Holloman Air Force Base in New Mexico, according to Air Force spokeswoman Ann Stefanek. His discharge date was unclear, she said. CBS reported that Kelley was dishonorably discharged in 2014 — receiving the military’s equivalent of a felony conviction. That separation raises questions about Kelley’s ability to acquire a firearm. The Gun Control Act of 1968 prohibits anyone with a dishonorable discharge from buying guns and ammunition. The status is also flagged in law enforcement databases. Neighbors said the gunshots they heard were thundering. Diana Segura, 69, was in the shower Sunday morning at about 11 a.m. when she was startled by a series of bangs so loud she thought a truck’s engine had exploded on the highway behind her home. Minutes later, sirens burst onto her quiet street and Segura walked outside and saw the unthinkable: multiple bodies on the ground outside the First Baptist Church, where she occasionally attends weeknight services. Standing outside her home down the street from the church, Segura stared at the throng of police cars and emergency vehicles, her head shaking in disbelief. (Darren Abate | The Associated Press) Law enforcement officers gather in front of the First Baptist Church of Sutherland Springs after a fatal shooting, Sunday, Nov. 5, 2017, in Sutherland Springs, Texas. Frank Pomeroy, the pastor of First Baptist Church, told ABC News that he was not present during the church service but that his teenage daughter, Annabelle Pomeroy, 14, was among the dead. The church is a part of the Southern Baptist Convention, the largest Protestant denomination in the country with about 15 million members. First Baptist reported an average estimated attendance of 100 in 2015. The church is affiliated with the Southern Baptists of Texas Convention, considered one of Texas’ more theologically conservative group of Southern Baptists. Mike Jordan, 50, was a few miles outside of town Sunday when he received a frantic call from his son telling him he needed to come home immediately. Jordan, who lives across the street from the church, said one of the shooter’s bullets went through the window at his son’s home, missing his two-year-old grandson by about four feet. Holley and Moravec reported from Sutherland Springs, Texas; Phillips and Lowery reported from Washington. Mary Lee Grace in San Antonio and Sarah Pulliam Bailey, Ed O’Keefe, Alex Horton and Devlin Barrett in Washington contributed to this report.